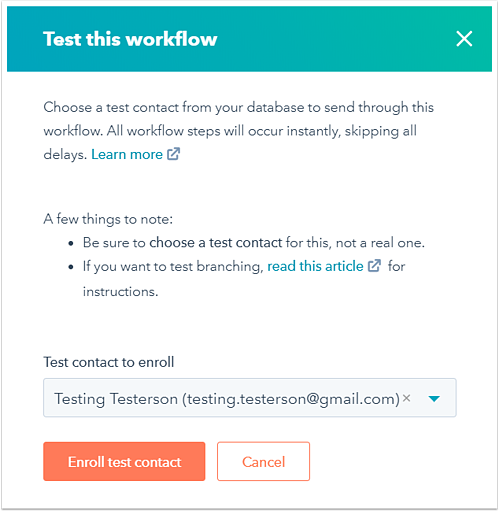 In your contact-based workflow, you can test contacts against the enrollment triggers to see if they meet them, and enroll test contacts to execute all workflow steps instantly, skipping all delays. Learn how to test your company, deal, ticket, and quote-based workflows. In the right panel, click Test criteria. In the dialog box, use the search bar to search for and select a contact to test against the enrollment trigger criteria. The right panel will indicate if the contact meets or does not meet the enrollment trigger criteria. 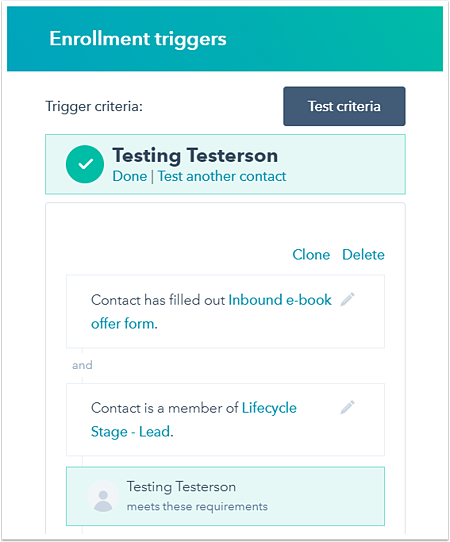 If a contact meets the enrollment trigger criteria, they will be enrolled in the workflow when it is turned on if the Enroll contacts who already meet this criteria checkbox is selected. 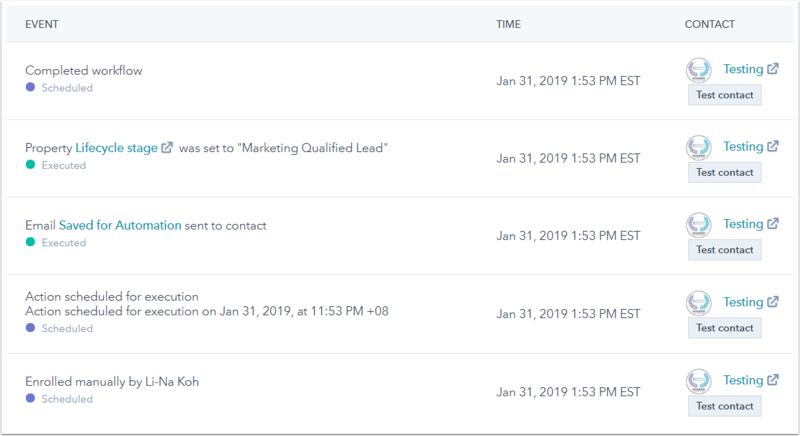 If a contact does not meet the enrollment trigger criteria, they will not be enrolled in the workflow when it is turned on, even if the Enroll contacts who already meet this criteria checkbox is selected. In the dialog box, click the Test contact to enroll dropdown menu and select a contact to enroll in the workflow. All workflow steps will occur instantly, skipping all delays, so it should be a test contact created for the purpose of testing the workflow. Please note: if you're trying to test if/then branches in your workflow that are contingent on actions taken between workflow steps, refer to this article: Test branching logic. At the top of the workflow, a confirmation message 'Your test contact was enrolled. You can check the status of action steps on the History page.' will appear. The workflow steps executed by the test contact will appear, with the most recent event appearing at the top. Test contacts are marked with a Test contact label below their name.